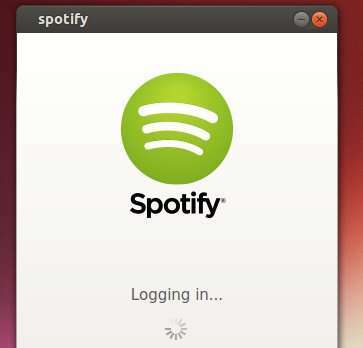 Installing Spotify desktop client in Ubuntu now is quite easy via the Snap universal binary package. A snap is an universal Linux application with all its dependencies bundled. It runs in sandbox and is isolated from other system software. 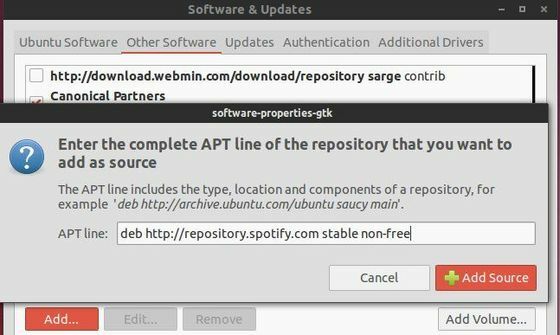 Spotify has an official apt repository contains traditional .deb packages for Ubuntu. For any snap issue, you may refer to forum.snapcraft.io. Ubuntu 14.04 Trusty Tahr, the next Long-term support Ubuntu release is coming soon. This simple tutorial shows you how to install the Spotify Client the official way from its repository. Spotify is a great way to listen to music by streaming it on your phone, in your browser, or on your Linux desktop. You can stream everything, upgrade and sync tracks and playlists offline, or purchase individual tracks to keep forever. 1. Search for and open the “Software & Updates” utility from Unity Dash. Click on Add Source button and then you’ll have Spotify repository in your system. Type in your password when prompt. You may download & install the .deb package from the web page if you don’t like to add the PPA. 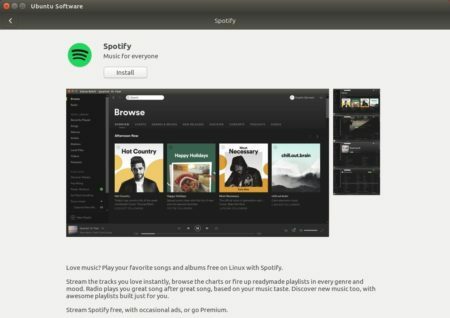 This tutorial is going to show you how to install the latest Spotify client from its official repository in Ubuntu 13.10 Saucy Salamander & Linux Mint 16 Petra. Spotify is a very popular music streaming service. Its client works on Android, iOS, Windows Phone, Blackberry, web browser, Mac, Windows, and Linux. A new app for messages! sudo add-apt-repository "deb http://repository.spotify.com stable non-free"
This simple tutorial will show you how to install the Spotify Client on Linux Mint 13, 14, 15 from the official repository. Spotify is a digital music-streaming service that gives you on-demand access to millions of songs on all your devices. It works on Windows, Mac, Linux, Android, iOS, Windows Phone 7/8 (7 no longer updated), BlackBerry (GSM only), Symbian. To install it from the official repository, press Ctrl+Alt+T to open terminal.